Rates shown are inclusive of all taxes and service charges. All rates in US Dollars are per room (single or twin occupancy). Rates here are available only for bookings made with this website, and are not available from the hotel directly. It was in the 15th century, Hoi An remains much the same, offering an amazing mix of ancient Chinese, Japanese and Vietnamese architecture; memories of different cultures which have lived on. Listed today as a World Heritage by UNESCO, Hoi An is certainly the most charming site of Vietnam. 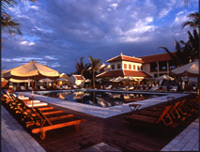 Victoria Hoi An Resort is situated 5 km from the little town of Hoi An, along a stretch of white sand beach, one side of the resort facing the river delta and the other side, the sea. Referring to Hoi An history and mix of cultures, Victoria Hoi An Resort is built like a small fisherman�s village, with small streets and water ponds, small houses with clay-tiled roofs and round Chinese cloth lanterns.